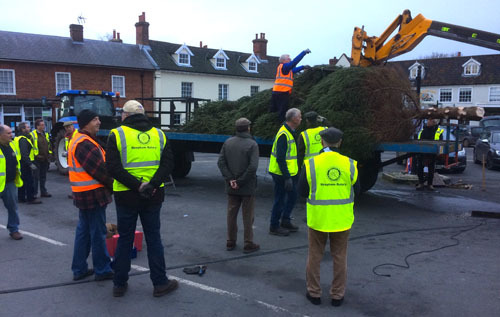 How many Rotarians does it take to put up a Christmas tree? Members of Reepham & District Rotary Club have been working on a number of community projects in the run up to Christmas. The club joined with the Festival of Light team to make the Market Place festive for the annual event and the Christmas season. Onlookers commented on how many members it takes to erect a tree when the machinery appears to do most of the work. Nevertheless, everyone had a role to play and it was good to get the job done quickly. The club welcomed Les West to a recent meeting to outline the need for maintenance funding in 2019, the centenary year of the Bircham Centre in Reepham. The club was able to make an initial donation to get things rolling and will be looking at other ideas to help in the year ahead. For many years Reepham Rotary Club has paid for water treatment boxes filled with emergency supplies to be ready for immediate dispatch to disaster areas: after natural disasters such as an earthquake or flooding, clean water is the most urgent need. Over the years the club has raised more than £12,000 to send more than 420 boxes. Much is funded by our Aquabox 100 Club – let me know if you would like to contribute. There are still a few tables left for the Rotary Club’s New Year Quiz and Chips at Reepham College, Whitwell Road, Reepham, on Friday 15 February, 7 pm for 7.30 pm.